TCM and the client will both sign a written estimate/proposal outlining all production steps and costs. The client will be asked to pay upfront a portion of the overall project costs. Additionally, the client will be expected to make payment for interim invoices as the production schedule progresses. TCM encourages all online marketers to stay abreast of Internet futuristic trends. The below graphic will take you directly to the Pew website where you can browse or download an in-depth PDF. Presently, the total costs for custom websites designed and constructed by Thieme Creative Media range from $5,000 to $40,000, depending on the size and complexity of each site. Determining fees for website design and content management is similar to asking the architect what will it cost to build your dream home. How many levels, bedrooms, bathrooms and the desired architectural appointment all have bearing on the final costs. 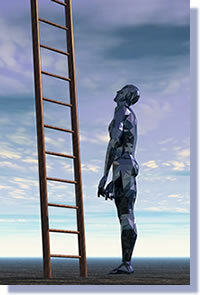 Metaphorically, how far up the ladder do you want to climb? Generally, our clients are paying between $8,000 and $15,000 for a custom-designed static website that has six main navigational buttons that collectively contain 20 - 30 pages of editorial content with supporting still images. However, if the client's marketing objectives call for a major database-driven component in the custom website design, the total media production costs could range from $20,000 to $40,000. These additional monies are necessary to cover the hourly rates of specialized PHP and ColdFusion programmers. The following will provide a general frame of reference on how we determine all costs that will be documented in a written estimate/proposal. Hourly rates: $60/hour [These rates are reduced by $20/hour when there is a continuous daily/weekly demand for these timely updates.] This rate applies when the client forwards continuous flow text in a series of paragraphs with minimal bulleted lists. The client can provide the new text electronically in Microsoft Word files that will be formatted in keeping with established website style sheets via HTML code or Cascading Style Sheets. Hourly rates for complex tabular data: $60 - $80/hour [This rate applies to creation of complex HTML tables and images to be sized, formatted and optimized for proper web treatment on a particular page. Thieme Creative Media will upload new and revised pages within three business days of receiving the material and instructions. Thieme Creative Media records all tasks in quarter-hour segments and provides a monthly breakout by day and time required for various tasks. When the client submits material after 3:00 pm and requests posting on the same day, Thieme Creative Media will charge a rush/overtime fee of time and a half.